The 2018 Ford F-150 continues to set itself apart from the competition by updating the revolutionary and exclusive all-aluminum body full-size pickup. The all-aluminum F-150, first introduced in 2015, manages to reduce the curb weight while preserving the payload and towing values expected of a full-size truck. A reduction in curb weight of up to 700 lbs. coupled with four efficient gasoline engines and their 6-speed or 10-speed automatic transmissions allows for remarkable fuel economy. The F-150 is available with three cab styles (regular, super and crew) with either a 4x2 or 4x4 drive train and three pickup box lengths. Six distinct trims are offered depending on the cab style and they include the XL, XLT, Lariat, King Ranch, Platinum and the Limited. All of these trims offer an impressive array of standard equipment but are further enhanced by optional equipment packages. The new, freshened exterior across all trims offers new grilles and bumpers, redesigned headlight and taillight assemblies and new wheel choices. These changes link the F-150's appearance to its larger Super Duty siblings. The interior environment is not neglected and an updated instrument panel and console designs offer a fresh interior appearance incorporating new colors and materials for seats. The four engine choices available on the F-150 include a new 3.3-liter PDFI flex-fuel V6, a 2.7-liter EcoBoost V6, a 3.5-liter EcoBoost V6 and a new 5.0-liter flex-fuel V8. The 3.3-liter V6 is mated to a 6-speed automatic transmission while every other engine is mated to the 10-sopeed automatic transmission. Each engine now offers start-stop technology and each transmission offers SelectShift and Normal, Tow/Haul and Sport modes while the 10-speed automatic further offers Eco and Snow/Wet modes. The class exclusive F-150 Raptor offers outstanding 4x4 off-road prowess in both a super cab and crew cab configuration. The Raptor includes Fox Racing off-road shocks with increased suspension travel and 35-inch all-terrain tires. A torque-on-demand transfer case with a mechanical-locking four-wheel drive system and 6 driver selectable modes in their Terrain Management System. 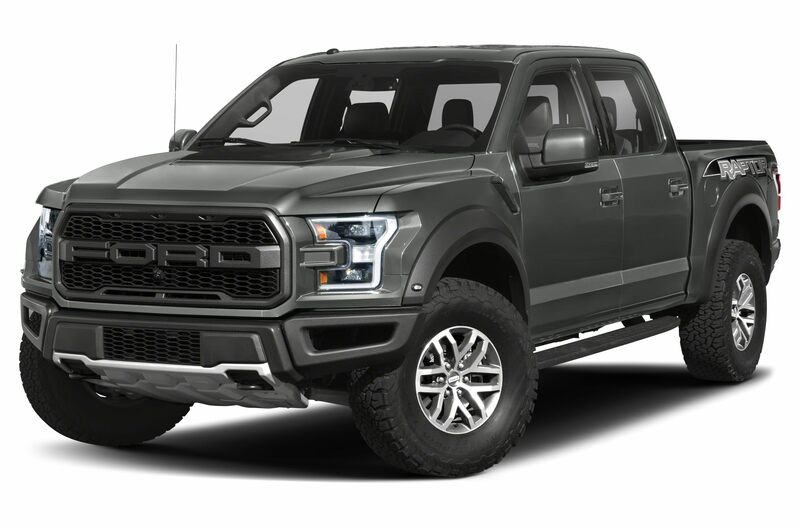 The Raptor is powered by a 3.5-liter EcoBoost High Output V6 engine mated to the 10-speed automatic transmission. Features that are available on the various F-150 models include Active Park Assist, Blind Spot and Cross-Traffic Alert, inflatable rear safety belts, stowable loading ramps, LED headlights and pickup box lights, a revised tailgate step, Pro Trailer Backup Assist, a remote tailgate release and a twin panel moonroof on the SuperCrews. For 2018, new exterior colors and a rearview camera with dynamic hitch assist are now standard on every F-150 model. The 10-speed automatic transmission is offered on several more trims and in the spring of 2018, a 3.0-liter PowerStroke Turbo Diesel engine will be offered. Other new features for 2018 include adaptive cruise control with pre-collision assist with pedestrian protection, a B&O premium audio system, heated windshield wiper park and SYNC Connect featuring WiFi for ten devices simultaneously. You must enter a valid 5-digit ZIP code in order to continue.